The first step is to do a quick audit of your current reporting process and find out which stakeholders receive your reports. If you know whom you’re reporting to and why, you can ensure your reports will be useful to everyone involved. Find out who receives the social media data in your organization. You may send reports to one person, but that person may then forward them on to others. Also, different teams have different needs. For example, a PR team may have different expectations than a community management team. Next, discover what actions your reports support so you don’t waste time reporting on metrics no one uses. Talk to the people you report to, find out their needs (and wants) and see what you can learn about the current state of your social media reporting. You’ll likely find some overlapping goals and be able to identify areas of commonality. If you’re the sole owner and consumer of social media reporting in your company, identify what you need to know about your performance and what you’ll do with this information. Try to distill it to a few clear goals, which will make everything easier in later steps. When deciding what to include in your reports, find metrics you can use in multiple situations and have some business benefit for your stakeholders. Just because you can report on something doesn’t mean you should. And the more metrics you include in your reports now, the more metrics you’ll have to keep supporting in the future. Reach or exposure: Measure the size of your potential audience. Volume: Track the conversation size and number of brand mentions. Engagement: Analyze the quantity and type of engagement your accounts and posts get. Audience: Learn who participates in a conversation, along with the most active users and influencers. Content: Monitor your top–performing (and worst–performing) posts. The metrics you use will depend on your needs and the social networks you’re measuring, but these core concepts are a great start. In addition to the general metrics above, you’ll probably have a few specific needs or requests from stakeholders you need to support. That’s great, because the more relevant and targeted your reports, the more useful they’ll be for your business. However, avoid creating custom metrics or anything you’ll need to calculate manually, unless they‘re really important. You’ll likely regret this later. It can take a long time to handcraft special calculations, especially if you’re not entirely sure how you did it the last time. Above all, be consistent. Make sure you’re reporting the same metrics in the same way each time. Add in percentage changes and other benchmarks to make it easy for your audience to interpret the results. There are many social media measurement and analytics tools you can choose from. However, only a few tools will help you get the precise information you need. Keep in mind that no tool is going to be exactly what you’re looking for. There are so many ways to analyze social media that every tool has a different perspective. Plus, social data is far from perfect and the kind of information that you can pull from a particular social media channel will vary depending on the channel. However, there is a product out there for you. Where does it get its social data? What kind of relationship does it have with the social networks? Does it include metrics on the networks you need to report on? What type of customer support or account management does it offer? What features are on the product roadmap? How long has it been around? What are its plans for the next 2 to 5 years? It’s important to trust that the tools you use are here to stay, have access to the highest-quality social data and have a team in place to make sure your questions are answered and the product continues to evolve. Social media changes quickly, so the right tools will grow along with the networks. You’ll save time if you have one tool (or a few tools) that provides the data you need so you don’t have to keep switching from tool to tool. Rather than use one product for each channel or need, find a better tool (even if it costs a little more) that can do most or all of this in one place. Remember that you often get what you pay for with social media tools. Free tools are likely to have less reliable data than their fee-based counterparts and they may not be around at this time next year. There are several great fee-based options out there, depending on your budget. The right tools will save you time, stress and effort, so the cost will absolutely be worth it. Finding the right cadence for reporting can be tough. It makes sense to generate some reports monthly, and others more or less often. And you’ll definitely be asked for end-of-year reports every December or January. So how can you meet all of these needs without spending 40 hours a week creating reports? Most metrics don’t need to be reported on weekly. If someone is asking you for weekly reports, dig a little deeper into the request. What are the stakeholders actually looking for? Maybe they want to know the top posts for the week so they can see whether a new campaign is working or a product launch was well-received. If so, you can probably answer those questions quickly without producing a full report. Or maybe you can commit to a smaller weekly report that includes a few highlights to answer key questions. 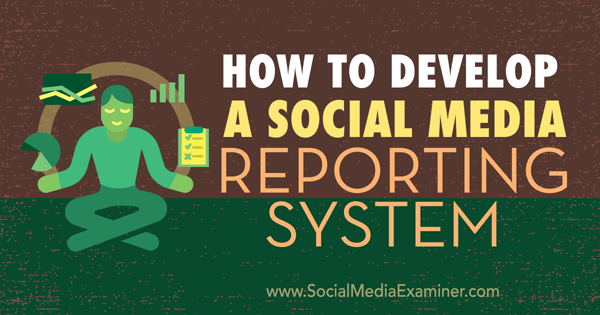 Monthly reports are pretty typical and one of the most useful time periods for social media reporting. They smooth out some of the individual daily spikes and let people see how things are going month to month. They also provide more insight into seasonal patterns than weekly reports do. For example, because Thanksgiving is on a different date each year, stakeholders can more quickly understand the seasonality of the metrics with a comparison of the entire month (rather than the week of November 22-28) from this year to the previous year. You may get requests from stakeholders for data that doesn’t make a lot of sense. You don’t always have to honor these requests, at least not exactly how they’re asked. Think carefully about what the stakeholders are asking for and look for something you already measure that can answer the question. You likely already do something similar, but maybe not in the way you’re being asked. See if you have existing alternatives before committing to something new. Google has pushed a core ranking algorithm update over the weekend. Zineb Ait Bahajji (in French), Gary Illyes and John Mueller of Google have confirmed on Twitter that what webmasters were seeing over the weekend was not the Penguin update we are expecting, but rather a core ranking algorithm update. On Friday, I noticed early signs of an update, and then, over the weekend, I called this a “massive update.” I asked Google for confirmation, and on Twitter they confirmed it was a core ranking algorithm update. Google rarely confirms core algorithm updates. They did confirm one back in May 2015 for us, but it is rare that they confirm these. So it is a big thing for Google to go on record that this update webmasters were seeing was related to the core update. Webmasters are still waiting for the Penguin update that was delayed and expected to be pushed sometime during this month. So there was a lot of confusion, with SEOs and webmasters thinking this update was Penguin-related. But the signs didn’t point to Penguin; it seemed more core search- or Panda-related. Now we know it was core search, and potentially also Panda, which is now baked into the core search algorithm.